I have been slowly working on readying the nursery for baby, which involved moving 2 other children into different rooms in the house, eliminating the office/sewing room, moving the computer and desk to the kitchen, and doing a major declutter of my sewing/crafting supplies to fit everything from the office into a room the size of a laundry room. Furniture has played musical chairs, rooms have been painted, light fixtures moved, and I think I finally have the room ready for this little one. I am thankful that while the bedrooms in our house are rather small, they are plentiful! I still have the white furniture from my nursery and bedroom when I was a child. 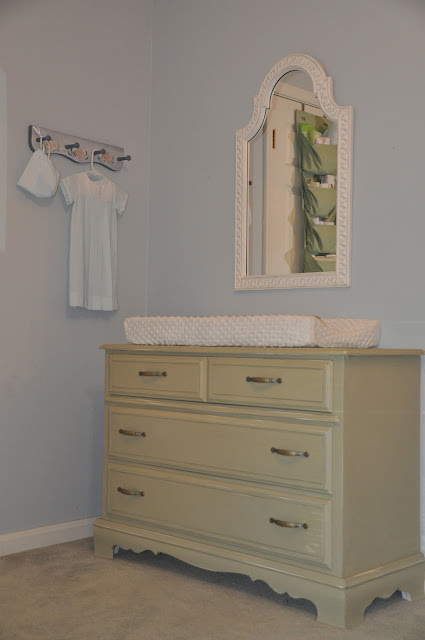 When my oldest was born, we used that furniture in his nursery, the dresser serving as a changing table. I always wanted a Winnie-the-Po*h nursery, and the walls of that room in our first house happily were a blue that perfectly matched the bedding my parents bought us for the crib. Some people redecorate the nursery with each child, but I never could see fit to let go of the beautiful things I had already, so the nursery has remained a constant, with only small variations as we moved from house to house. Our youngest, Dimples, stayed in the nursery until just a few months ago, and actually stayed in the crib until she was four! Mostly I was just torn between moving her in with one of her sisters versus redecorating the nursery as a bedroom for her, and she loved that crib. We did finally clear it out. Last summer we got rid of it, got a "big girl" bed for her, and kept her in the same room. I didn't make any major changes to the room, but I did decide that white dresser/changing table was due for some freshening, so I decided to try my hand at chalk paint, and give it a pretty coat of green. I am terrible at before photos, since I usually start a project and only after I get going think about taking a before picture, so here is the one I took after I had already painted one drawer. I was a bit skeptical of the claims on this paint, no need to prime, thin the paint with water if needed, and finish with a coat of wax? Sounded too simple considering the number of furniture refinishing projects I did back in the days when I only had two kids! I started the project in early December, about 4 weeks before we found out that we were expecting another little one! So, that dresser that was intended to hold Dimples clothes, has once again reverted back to a changing table. Here is the finished product. I love how it turned out! I learned a few things - the paint does better if thinned - and I think a few spots needed another coat, but since I was already planning to sand the edges and give it a distressed look, I don't think it is a big deal. I wish I could find better handles, but that was the best I could find that fit the existing holes in the dresser. And the gown to the left? First baby gift, from my mom - for our little boy! So pretty! We've never had a changing table - never any room for a nursery. So very excited for you all!